I think we got about another 2.25 inches of rain this week. Hurray! Although, for the garden at least, we can hold off on more water for now. 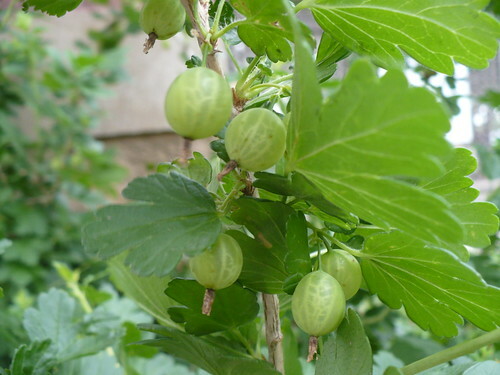 The gooseberry bush is loaded again this year. (The thorny one, that is. The thornless one…not so much! )These will be a dark red color when they are ready to pick. The black raspberries are also ripening as we speak. 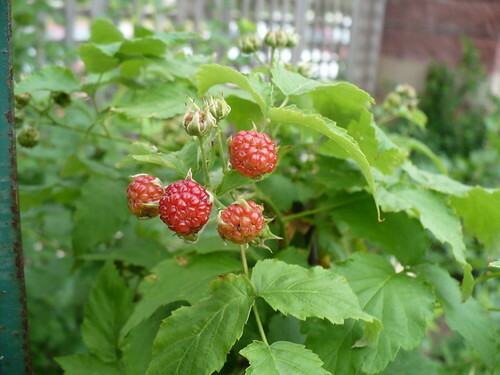 This first berry might be ripe by Monday (if someone doesn’t pick it this weekend, thinking it’s already ripe!). Any bets? 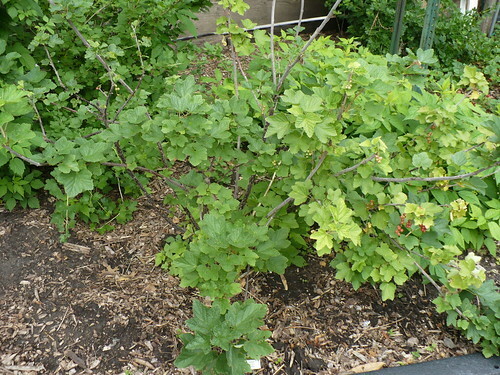 The red currant bush, on the other hand, is not looking so good. It was so loaded with fruit last year, and this year it has hardly any fruit. The fruit is also getting shriveled. I’m thinking there is some root damage here. Hard to say if it was the heat last summer, the cold last winter, the dry spring, or the heavy crop last year that hurt it. Probably some combination of the above. About half of the plant was dead to the base this spring, and what’s left isn’t very healthy in appearance. I doubt it will make it, if we don’t decide to put it out of its misery before it completely dies. It’s sad, because it was so nice last year! 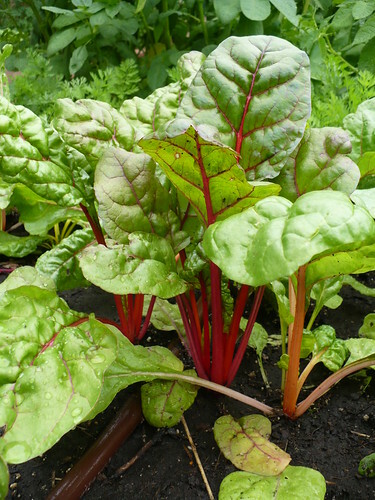 A gratuitous Swiss Chard picture, because you know I can’t help myself. It’s already photogenic! Our second planting of tomatoes is growing in my office. They will be planted in mid-June. They are all heat-set types, which means that they will be boring, round red tomatoes. Not that I’m at all prejudiced! It will be interesting to see how they do, though. Hey, look what we’ve got! 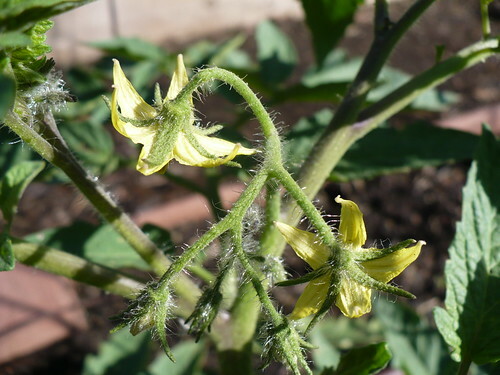 These are the first flowers on our tomato plants. These flowers are on the ‘Early Girl’, and we’re also seeing a few flowers on the ‘Margherita’ roma tomato. Posted on May 27, 2011, in PhotoEssays and tagged flowers, fruit, salad greens, Tomatoes. Bookmark the permalink. 2 Comments. You’ve got sun too! It’s been all clouds and rain up here, which is nice, but the tomatoes haven’t put on much growth. I read a tip on Apartment Therapy this year of just planting tomato seeds instead of seedlings. Have you ever tried it? I found it interesting, so planted one of my pots with a seed, but the rest with seedlings. We’ll see if it works. It certainly is possible to plant seeds instead of seedlings, but I don’t think it gets you any advantage. Tomato plants transplant really well, so there is minimal transplant shock. 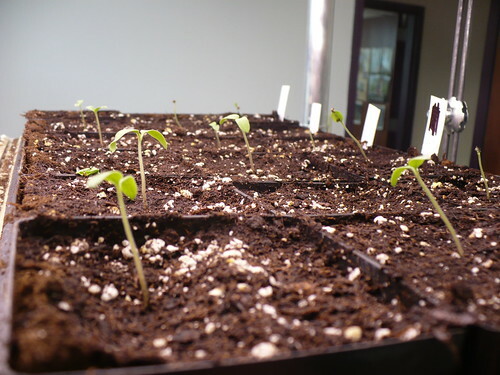 Seedlings are usually 4-6 weeks old, so unless you plant the seeds 4-6 weeks early (when it is still WAY too cold), you are just going to be 4-6 weeks behind. Luckily, here in Kansas, the growing season is long enough that you should definitely get tomatoes from your seed-planted tomato.